Sharp MX-M754N | The Miller Company, Inc.
Offers a choice of five high-performance finishers, from a compact inner finisher to a high capacity, floor-standing saddle-stitch finisher. 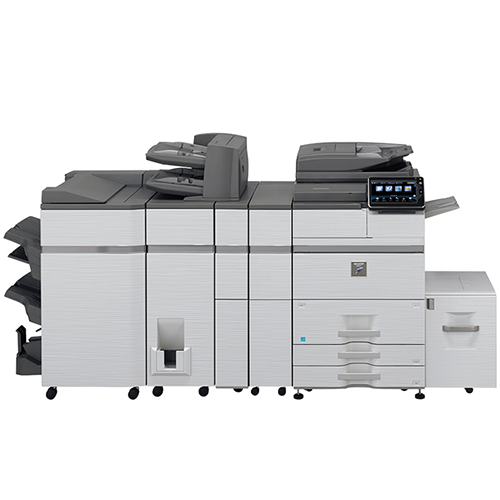 The Sharp MX-M654N and M754N monochrome workgroup document systems delivery high productivity and strong versatility. They offer powerful multitasking workflow features and exceptional image quality at speeds up to 75 pages per minute. Designed for large workgroups and departmental environments, these models combine a versatile modular design with a tablet-style menu navigation and powerful output capabilities that can help virtually any office accomplish more in less time.